Summer 2004: Our lengthy trip begins with two nights in Guanajuato, in central Mexico. 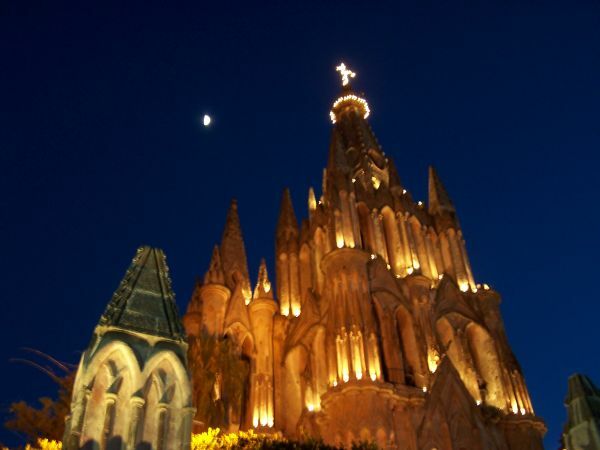 Then we travel to San Miguel de Allende for 17 more nights, and quite a bit of time studying the Spanish language. Both cities are located in the Mexican state of Guanajuato, about 4 hours north of Mexico City. These cities are rich in Mexican colonial history. The Mexican revolution began in these mountains, and the cities themselves were built with the considerable profits from the silver mines here. The elevation of San Miguel is over 7000 feet. The weather is wonderful year-round, though we're in the rainy season now in July. Daytime temperatures reach around 80 degrees, and nights get down to the low 60s. Neither of our rooms has had air conditioning, but we haven't really needed it. Pozos was once a city of 60,000, but now the population is under 200. Talk about Boom to Bust! We looked around at the ruins of the silver mines, and even descended into one of them with the help of a local guide. As a first look, here's a photo from the main square of San Miguel de Allende, looking up at the moon and the church "La Paroquia".